The blog below was originally written for the AST but, in the context of the South Esk catchment, and the continuing disaster on the Scottish west coast, it is I think highly relevant. Charles Clover’s leader in today’s Sunday Times (25 August 2013) is a reminder that peer-reviewed scientific data are not seen as facts by everyone. Clover gives the example of the Scottish Salmon Producers’ Organisation’s (SSPO) “slavish attempt to ingratiate itself with the ruling Scottish National Party, expressed by its chairman, Phil Thomas, as ‘Scottish food, Scottish jobs, Scottish communities, Scottish economy, Scottish salmon'”. Clover comments further, “it is hard to say who looks after the traditional public goods of Scotland: the landscapes, the marine life and the wild fish”. Indeed Mr Clover, you are right. Another example of scientific data denial is the interminable and often wildly inaccurate efforts of Dr Martin Jaffa, the publicist for the pro salmon farming company, Callander McDowell. Dr Jaffa’s most recent post is published on the Callender McDowell website under the title ReLAKS. The robust response of St Andrews University in standing firmly behind the scientific conclusions of the original Royal Society article poses the question, ‘whose evidence do you trust; the data offered by the world class Institute of Ocean Sciences at St Andrews University, or the statement by the industry propagandist, SSPO? In my view there is no context. But then I am biased because St Andrews is my Alma Mater! Perhaps optimistically Charles Clover then states “the scientific debate may have a way to go but the findings look certain to alter the development of the industry”, and later in the same paragraph, “In Scotland landowners may have the ammunition to force fish farms away from the mouths of wild salmon and sea trout rivers. Worldwide investors have been given notice that the future lies not in sea cages, but in close containment systems that separate farmed fish from the environment”. Charles Clover’s article comes at the end of the week in which the Natural Capital Forum announced its “Revolution in how businesses and governments account for natural capital”. There will be a conference in Edinburgh on 21 & 22 November 2013 to discuss the objectives of the Forum. The conference takes forward the 2012 UN Earth Summit, an aim of which is that “by 2020, at the latest, biodiversity values have been integrated into national and local development and poverty reduction strategies and planning processes and are being incorporated into national accounting, as appropriate, and reporting systems”. Also last week Scottish Natural Heritage (SNH) announced the designation of six indicator species designed to act as ‘canaries’ for the coastal environment as it is affected by climate change. SNH’s remit is of course the Scottish environment, which omits migratory species that spend parts of their lives elsewhere. While Ospreys, Painted Lady butterflies and basking sharks are migratory visitors to Scotland, the Atlantic salmon and the eel are special as freshwater/coastal/oceanic indicator species. I am reminded of the campfire song that goes something like ..”the hip bone is connected with the thigh bone, the thigh bone with the knee bone, the knee bone with the shin bone” etc. The reality we face is that, in the face of huge changes in the earth’s climate, we need to think bio-regionally, outside national borders. Now is the time for ecologists, meteorologists and climate change monitors to work across the disciplines. Fisheries scientists, biologists, managers and the public need the big picture to make the right decision on the ground or river bank. This summer has been warm and dry, unlike recent summers in the east of Scotland. The low rainfall and comments made by some people that “this year is the lowest level they have ever seen the South Esk” might give the impression that there is a serious drought and that the river is in some kind of trouble. In fact neither of these statements are true. Low water at the first N bank groyne in Tyndals Pool. Even in this low level the pool has ample room and depth to provide security and well oxygenated streamy lies for resting fish. While it is certainly the case that June, July and August so far have all been drier than at least the last five summers, these conditions used to be the norm. I only have to think of the summers of 1975 and 1976 when Peter Annand described the South Esk as “an unfishable ditch” to find two years when the river was lower and water temperatures higher. May and June 1995 were also dry, hot months and I remember the weather breaking at the end of June and bringing with the cooler water temperature a tremendous run of sea trout. The Boat Pool at FCW in low summer water. This pool holds large numbers of salmon and sea trout in such conditions. It is quite normal – even in this year of very low sea trout catches – to see a shoal of 200 – 300 fish in this pool, plus a few salmon. The early nineties were years of good sea trout numbers in the South Esk, with weeks at Finavon and Inshewan of over 50 not unusual. There were also some big sea trout – up to 12 lbs – in those years.There was plenty of evidence that the river was at that time producing good numbers of sea trout smolts, and that recruitment of juveniles was at a high level. It is possible that things have changed since then, and the cause may be the weather, perhaps resulting from climate change. SEPA measurements of the amount of water in the river, especially at times of peak flood events, has risen appreciably. Casting into Red Brae Stream in bright summer conditions. This pool is best fished at dusk or dawn at such times. Red Brae always holds fish. Increased energy in the river at times of big flood events will have moved many thousands of tons of gravel and cobbles, leaving larger diameter stones in the bed of the river and moving the smaller stuff downstream to new depositing zones. Bigger stones (cobbles) favour bigger fish spawning habitat, which may help to account for the improved numbers of salmon, as opposed to sea trout, in the river. Certainly, in the FCW catch returns there was a turn around in the late nineties from a predominance of sea trout to the situation as it is today where salmon and grilse catch numbers routinely exceed those of sea trout. Such consistent catch returns may well be an indication of the effects of climate changes in the South Esk catchment. Last week we had a most welcome visit from Aberdeen University’s Department of Natural History. The visit was to look at the abundance and condition of Freshwater Mussels (Margaritifera Margaritifera) at Finavon. Here’s their informal note to me after the visit. The freshwater mussel – Margaritifera Margaritifera – a splendid name for a mysterious mollusc. But an animal that tells us a lot about the health of the river. 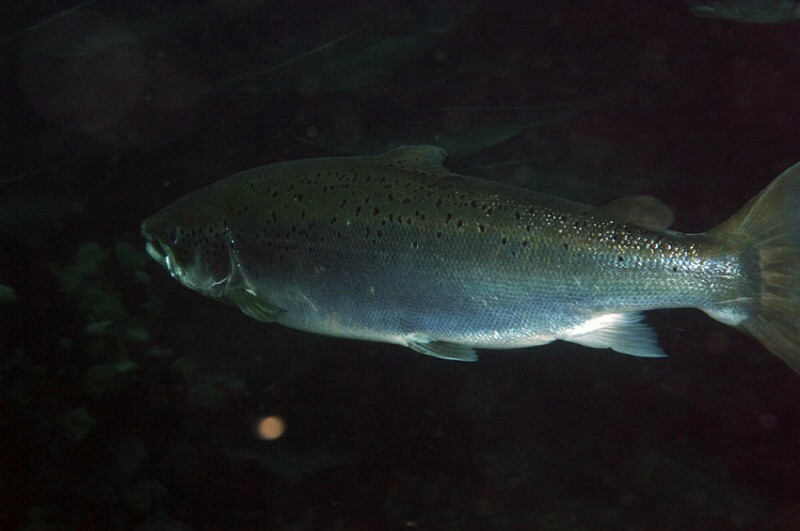 Its dependence on migrating salmon and sea trout to recolonise the upper reaches of the catchment when its larva (glychoda) hitches a ride in the gills of young fish. A wonderful piece in the natural jigsaw! This section is unstable in sections, with large deposits of coarse and fine mobile riverbed sediments – typical of the South Esk! The riverbed in the upper sections (Boat Pool, Volcano) appear generally shallower and less stable than the deep, rocky pools further downstream. There are numerous stable patches, however and mussels found throughout. Some old engineered modifications (weirs, reinforced banks etc) noted, but the mussels seem to be regenerating in many places. 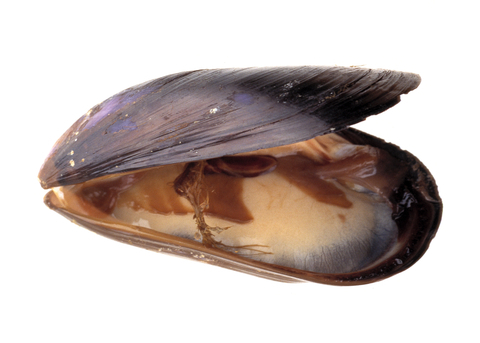 This is evidenced by the relatively large numbers of juvenile mussels (<6.5cm shell length), which indicates that recruitment has been successful in recent years. Below the sluice bridge (Haugh’s Pool? ), there is a “sink” bed, with hundreds of mussels settled in a large deposit of fine sand. These may have redistributed after the big flood last year. The riverbed does seem to have been changed in places (in the last decade), with mussels in new places and missing from old ones etc, again possibly linked to flood effects. Quite a few scattered shells – probably flood mortalities. Overall, I would say the Finavon mussel beds are currently in pretty good shape. The South Esk habitat does appear to be under heavy pressure, mainly from agriculture effects etc, but the mussel population appears to be stable, based on our findings so far. Full details will be available later, but I wanted to pass you some info for now. SNH will have a full report and info if you wish to acquire all the data , probably next year since the South Esk survey is part of a larger, national mussel survey. For me that is great news because I have been worried about the condition of our mussel beds. Now we know that they are recruiting successfully in this middle section of the South Esk, we can but hope that the good work of SEPA starts to take effect on the amount of silt clogging our gravels and cobbles. 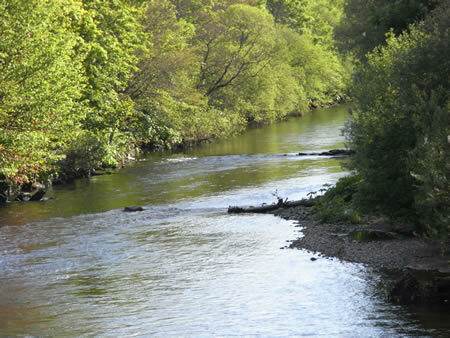 It has been a very poor season for catching sea trout on rod and line at Finavon. As I write this bulletin on the 2nd of August, our total catch is 13 sea trout so far this year. To put that in perspective, that is the lowest ST rod catch at the end of July at Finavon for more than 30 years. Our local rods have fished hard, some of them all night through on a number of occasions. As catch reports came through, and our syndicate members realised that sea trout were not being caught, morale dropped, resulting in fewer visits to the river. 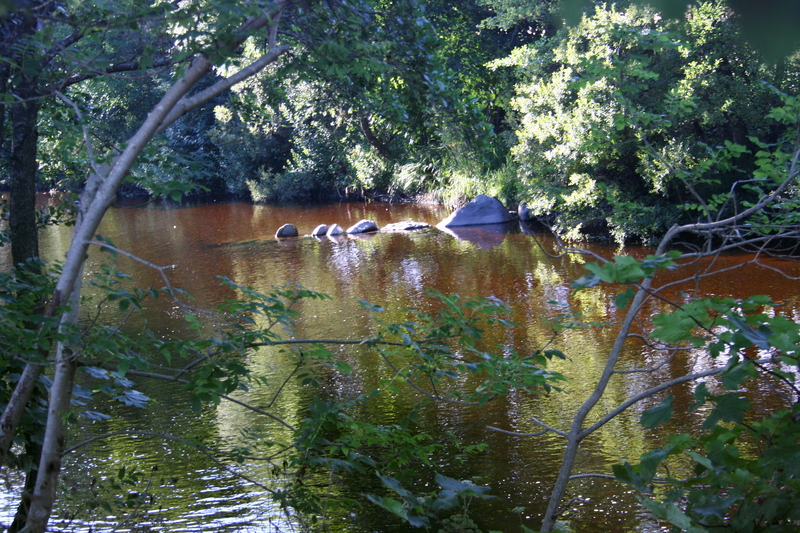 The photo above shows Beeches in low water. After winter floods in 2012/13 eroded the south bank above and below the Aqueduct, Beeches came into its own, as well as the deeper water at the head of Haughs Pool. 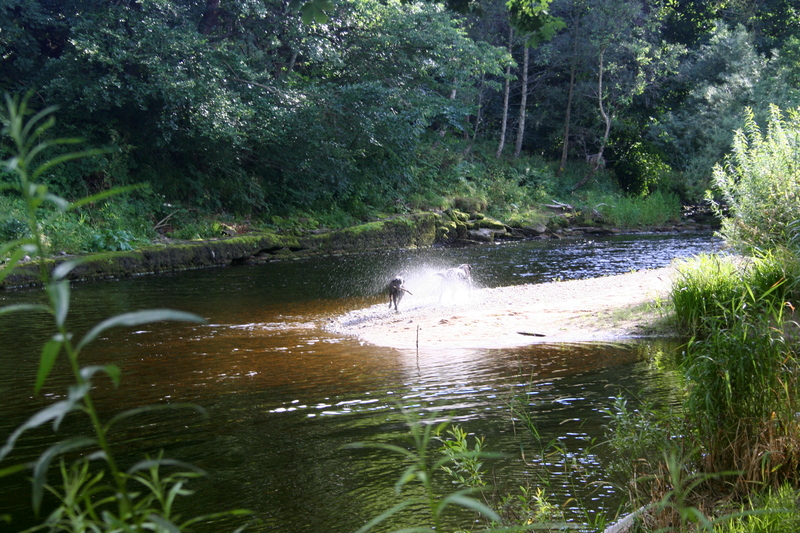 Throughout the season these pools have been occupied by salmon and sea trout. As I write this blog there is a nice shoal of grilse that can clearly be seen from the Aqueduct, but my guess is that they are virtually uncatchable! 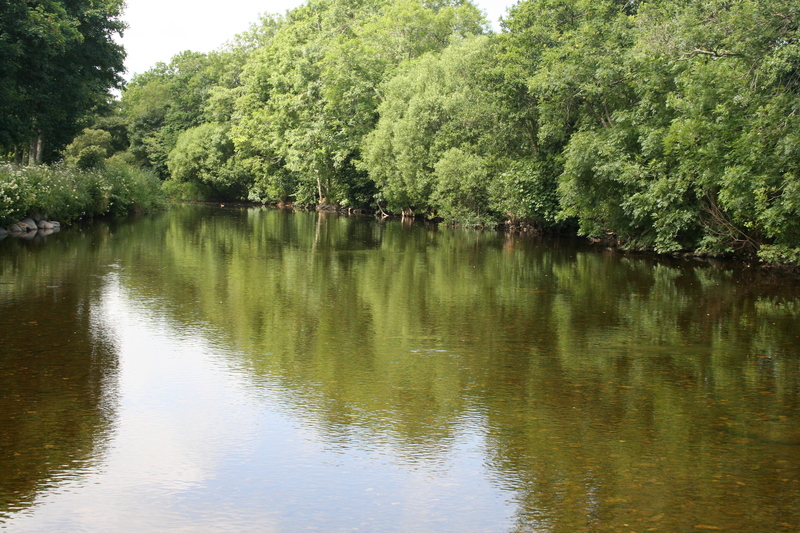 Low angling effort has therefore almost certainly been a factor in the poor returns, and the extended low water and high temperatures throughout July have also contributed. Other beats such as Cortachy and Inshewan have had better returns than FCW, but in general seatrout catches on the South Esk have been poor this year. Another factor in our catch returns is that very few of our anglers stay through the night. In former years most of our seatrout were caught in the pre-dawn period which I suspect is being unfished this year. I have learned to take a philosophical view of catch returns, although I accept that many people make decisions based on numbers displayed on Fishpal. 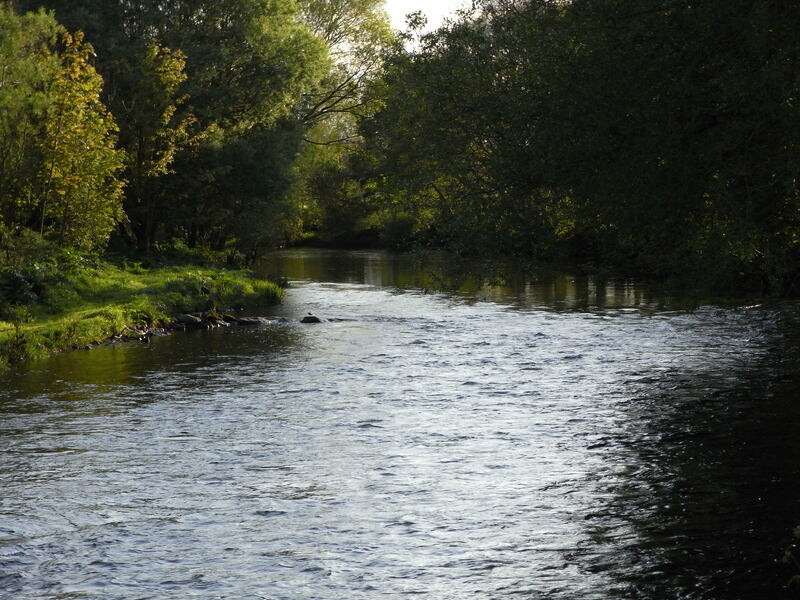 The points as far as I am concerned are that the river is in good nick (which generally it is, although I acknowledge there are problems, many of which I have written about in these blogs) and also that there are fish in the river. Two black labradors spray drying each other after a dip in a very low Red Brae in the heat of the July drought. As I continue writing this blog on 7 August I note that there are some fresh grilse at the head of Haughs and that Derek and I accounted for three salmon (all returned) in the recent freshet. There is observational evidence that there are some new fish in the river, and their numbers should start to build up as the late summer progresses. As far as sea trout are concerned, the season is over – bar the shouting. Last night I was invited for an informal chat with the Kirriemuir Angling Club committee. It was an interesting discussion, mainly but not exclusively on the subject of the mixed stocks coastal nets at Usan. Not surprisingly, there is a high level of frustration within the committee on the apparent powerlessness of the Fishery Board in a) monitoring b) enforcing the weekly netting slap times (from 1800 on Fridays to 0600 on Mondays throughout the netting season). The fact that noone knows what is happening makes the matter appear bigger than it should. 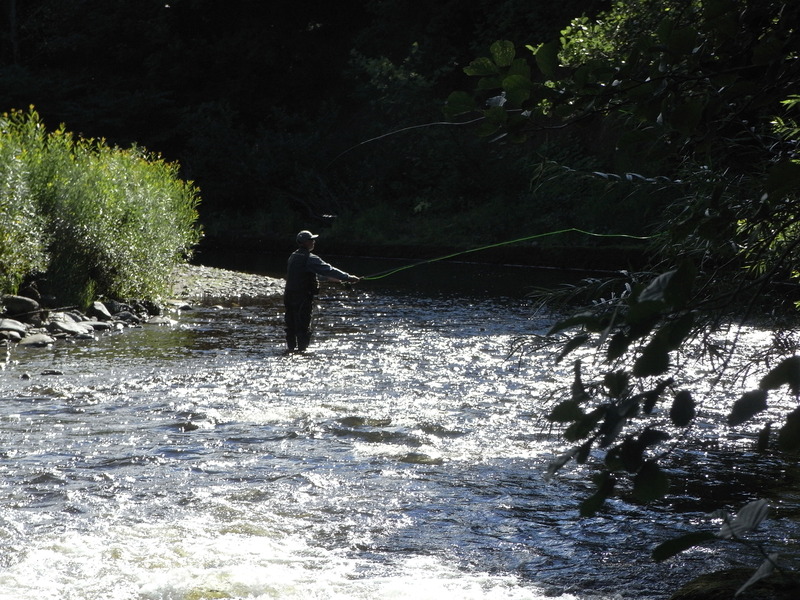 This photo shows Harry’s Bar at a nice height for a late summer grilse or salmon. It was in this pool that Derek caught a nice salmon in early August and lost another before leaving for fishing duties in ‘another place’! My personal view is that ‘keep-ins’ (when the netsmen decide for reasons of ‘safety’ to continue fishing throughout the statutory slap period) should be in the public domain and published weekly by the board. It seems extraordinary, however delicate the behind-the-scenes activities of the fishery board, that in this day of freedom of information we are in the pre-computer age as far as being kept updated is concerned. It would be interesting to see if under FOI this information should be in the public domain. I will write more fully on the evening spent with the KAC committee in my next blog. In the meantime, if any of my readers can spare three or four hours next Sunday to help with pulling out Himalayan balsam plants we are meeting at my house at 1100. Beer and sandwiches and a day’s fishing in the autumn for anyone who comes to Finavon to help our assault on the dreaded weed. We are NOT dealing with Giant Hogweed. That has already been done professionally. Please phone me (07748 634 658) if you can attend.